Keep fresh herbs in good condition in our tailor-made herb pot. Designed to accommodate fresh herbs sold in square plastic pots in supermarkets. The plastic pot will fit directly into our herb pot for no-mess storage on the kitchen windowsill. Simply remove herbs for watering, allow to drain & then replace. With careful watering, herbs will remain fresh & in good condition for several weeks. 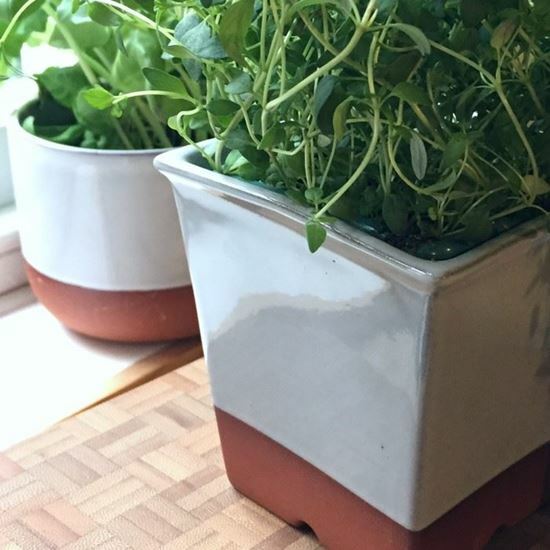 This herb pot with pale grey glaze finish will look at home in any kitchen.